In my previous two posts on the Fall of the Roman West, I concentrated on the effects of various Germanic barbarian confederations and the Germanisation of the Roman army, in the West in particular. The three main Germanic tribal federations of the 4th and 5th centuries were the Vandals, the Visigoths (also known as the Tervingi) and the Ostrogoths (probably the same people as the Greuthungi). One thing to be borne in mind when discussing these barbarian tribal groups is that they were genuinely confederacies of tribes, often containing non-Germanic elements, such as Sarmatians, Alans and others. There were other Germanic tribal grouping, Gepidae, Suevi etc, but they were all under the same kind of pressure in the second half of the 4th century and that was pressure from the Huns. The effect of this Hunnish pressure was to break down their stable confederacies or “kingdoms” in the area north of the Black Sea and push them westwards into Roman Moesia, Pannonia, Dacia, Illyricum and even further west, into Italy and Gaul. As we have already seen, the Romans were under pressure from these confederacies and this led to considerable instability, a weakening of the integrity of the empire, notably in the West and a reduction in tax revenues. When we add in the effects of numerous civil wars and the almost incessant rebellions of legions across the western empire, the breakdown of central authority and the reduction of available military manpower, we see the rise of the barbarians as a force within the empire, with wholesale recruitment of Gothic, Frankish and Vandal warriors and the accession to positions of power of Germanic or half-Germanic military leaders. We also see the penetration of Germanic leaders into the upper echelons of West Roman society, with marriages between leading senatorial families and members of the tribal aristocracies. At the end of the 4th century we see the first direct clashes between the westward moving Huns and the Eastern Roman empire, with penetration across the Danube and into Moesia and Thrace. The Romans in the East were able to bribe the Huns and therefore deflect them westwards towards the less defensible provinces of the West, while at the same time strengthening the defences of the Eastern Empire, including building the famous Walls of Theodosius, which were to protect the city of Constantinople for a thousand years. The West was so far fortunate but by the middle of the 5th century, after several incursions into the Eastern Empire, the Huns moved westwards again, under the leadership of their most important rule, Attila. Until around 450, the Huns had been on good terms with the Western empire and Attila had even forged an alliance with Emperor Valentinian III and supplied troops to aid the magister militum Aëtius in his wars against the Visigoths. In another of the power struggles that marked the imperial court of the West, Valentinian’s sister Honoria sought help from Attila, which he apparently understood to be a proposal of marriage and asked for half of what remained of the West as his bride price. Valentinian obviously rejected this and exiled his sister but the outcome of this was to give Attila an excuse to launch his armies into Western Roman lands, and the Huns were successful in laying waste to much of the north of Gaul until they were eventually checked in battle by an alliance of Romans, Burgundians and Visigoths, under Aëtius, a Roman patrician and western magister militum, at the Battle of the Catalaunian Fields near the modern day city of Châlons-en-Champagne. This was not the end of Attila though, as in 452, the following year, he returned to Italy at the head of his army and ravaged the northern part of Italy, sacking cities and threatening Rome. Aëtius was unable to offer much resistance, as his forces were a shadow of those of the previous year and it fell to the emperor Valentinian and the Bishop of Rome, Pope Leo I, to negotiate a peace with the Huns. Because of the destruction caused by Attila, and the shortage of food caused by a famine the previous year, it suited Attila to withdraw back across the Danube. The presence of an Eastern Roman army behind him may also have been instrumental in helping him reach this decision. The threat of Attila was finally removed the following year, 453, when the great Hunnish leader died. The confederation that he had forged fell apart and his warring sons were unable to re-impose a unity, allowing the Germanic Gepidae and Goths to defeat the Huns, which removed them as a threat to the Roman empire. A year after the death of Attila, Valentinian III, alarmed at the power of his magister militum Aëtius, personally assassinated the great Roman general at the imperial capital of Ravenna. Valentinian himself was murdered in turn by the patrician Flavius Petronius Maximus and by two allies of Aëtius. Maximus then assumed the purple, but was to rule for only a few months, being killed by the Roman mob, terrified at the news that Gaiseric, King of the Vandals, had invaded Italy. 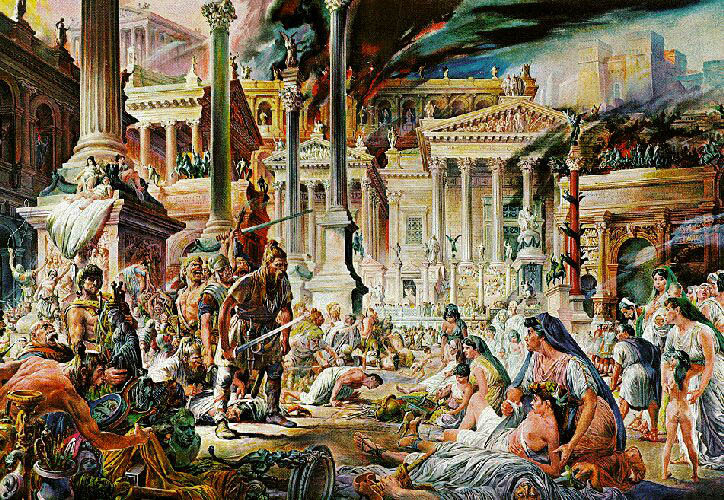 Gaiseric’s Vandals sacked Rome, looting and taking slaves. He also captured the empress Licinia Eudoxia, the widow of Valentinian, who Maximus had forcibly married and who was probably instrumental in the appearance of the Vandals in Italy. After the death of Valentinian, the Western Empire only had another 25 years of existence, before the Germanic general Odoacer deposed the last emperor of the West, Romulus Augustulus and became the first non-Roman ruler of Italy. There were a few emperors in the last 25 years, most ruling for only a short time and few of them capable of much in the way of independent action. For most of the last two and a half decades of the Roman West, the real power was with the last great Germanic magister militum, Flavius Ricimer, a Visigothic soldier who became the de facto ruler of what was left of the western empire, dominating Pope Leo and creating puppet emperors, as he could not himself rule by virtue of his barbarian origins. However, by the time of Ricimer the real damage had already been done. 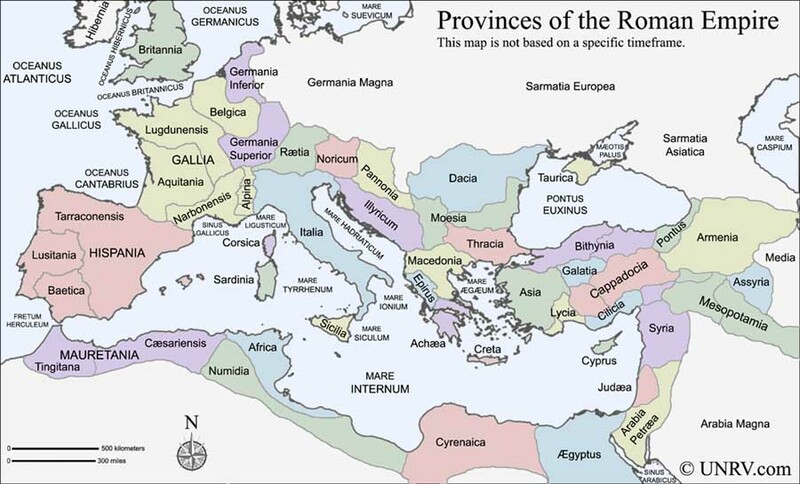 Little remained of the western empire, outside of Italy itself. 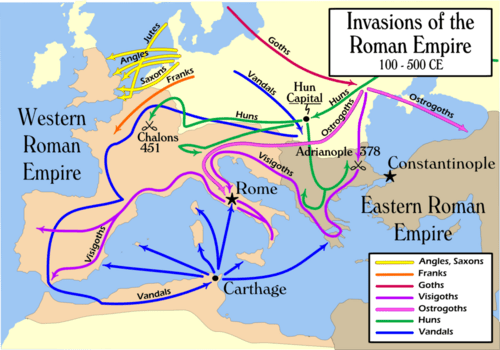 The westwards migrations of the Goths and others occurred because of the population movements of the Huns and the devastation wrought initially by the Germanic tribes and later by the Hunnish armies had already fatally weakened the power of the Western Augusti , leading to the secession of huge areas of the Western empire. 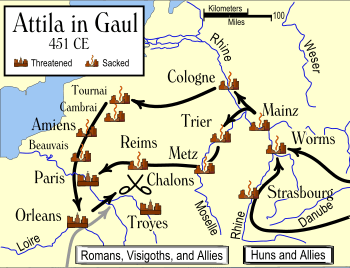 The permanent presence of the Visigoths in southern Gaul and Iberia, and the Vandals in North Africa, deprived the Western treasury of tax revenues, leading to the weakening of imperial military power and bringing about a reliance on Germanic troops and allowed the rise of the succession of barbarian military strongmen who came to be the real power in the West, raising and removing emperors at will until it hardly seemed to matter if a Roman wore the purple at all. Glad I found this blog – loving the history stuff. I’ve got lots of reading to do now…. !